Set sail with our pre-assembled sailing ship models, including modern ships, famous pirate ships and fabulous tall ships. Great conversation pieces or just to display on a shelf. Find any thing from one of her majesty's sailing ship's to the Queen Anne's Revenge. Take your pick, they are all great vessels. Here are some of the most famous boats that everyone has heard of, from The S.S. Minnow to the Orca, and even Jenny-- Forrest Gumps shrimp boat. 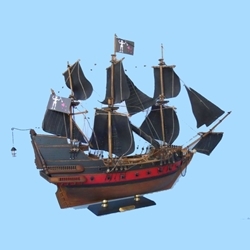 "Shiver me timber's," it's the Model Pirate Ship Collection. Find your favorite, Black Beard, Henry Avery, or even Thomas Tew's pirate ship. These ships are replicas of the many ships used by our United States Coast Guard as they keep our waters safe.